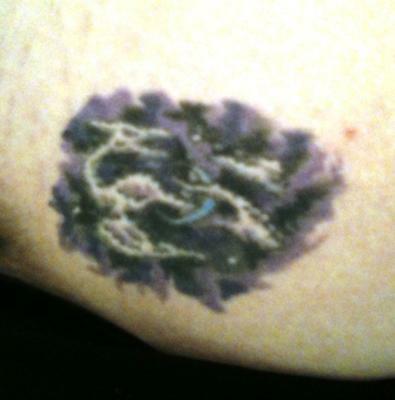 I have a tattoo on my right hip of a cloud shaped like a dragon, and a blue crescent moon. I got it to symbolize a man I once loved with all my heart. Little did I know that it would continue to symbolize him even after he tore my world apart. When I first designed the tattoo (yes, I designed it myself), I decided to shape the cloud like a dragon because he loved dragons, and I had long used them to symbolize him in other ways, such as a dragon charm on my bracelet. I chose to use the cloud because he was mysterious and "stormy." The blue moon is shaped like a "C," which is the first letter of his name, and because he was the moon in my world. Years later, after being cheated on and used for too long, I left him...or had him leave...not that we were "technically" together, anyway, but he lived with me. At first I thought I would regret the tattoo, but I never have. For one, it is something I designed myself, and I am proud of it. For another thing, it has now taken on a new meaning. The dragon-shaped cloud reminds me that nothing is ever as it seems. Sure, that cloud looks like a strong, wild dragon, but it will disappear with the next rain, much like him and his love. And the moon, well, he was there for me once in a blue moon, and so that blue moon reminds me to only ever count on myself. I am now happily married to a man I have known for almost 15 years. I plan to get a tattoo on the other hip to symbolize him, as he helped me to get over my ex. However, I am going to keep this in mind and make sure that it is something that I can always feel proud of, even if pigs fly and we fall out of love. Hm...perhaps a flying pig would be a good idea...it would remind me that true love is something that is magical and fantastical...but also that pigs can fly sometimes, and what seems unfathomable can sometimes become reality.